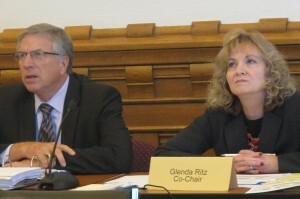 Southwest Allen County Superintendent Steve Yager, left, and State Superintendent Glenda Ritz listen to a presentation during the final A-F panel meeting. Indiana isn’t moving away from A-F letter grades for schools, but the metrics underlying the statewide accountability system will look a lot different moving forward — and it could mean more state tests. A panel that’s spent six weeks rewriting the rules used to calculate school letter grades adopted a final report Monday. It goes to the State Board of Education for review next week. 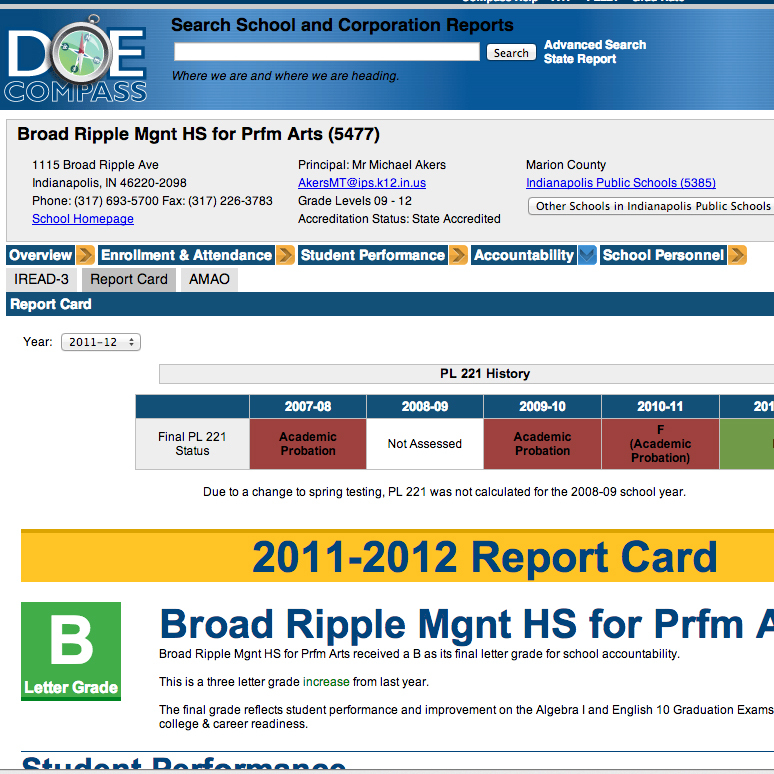 Proposed changes include switching to a 100-point scale and adding data points for reading scores. But the biggest difference comes in the measurement of growth. 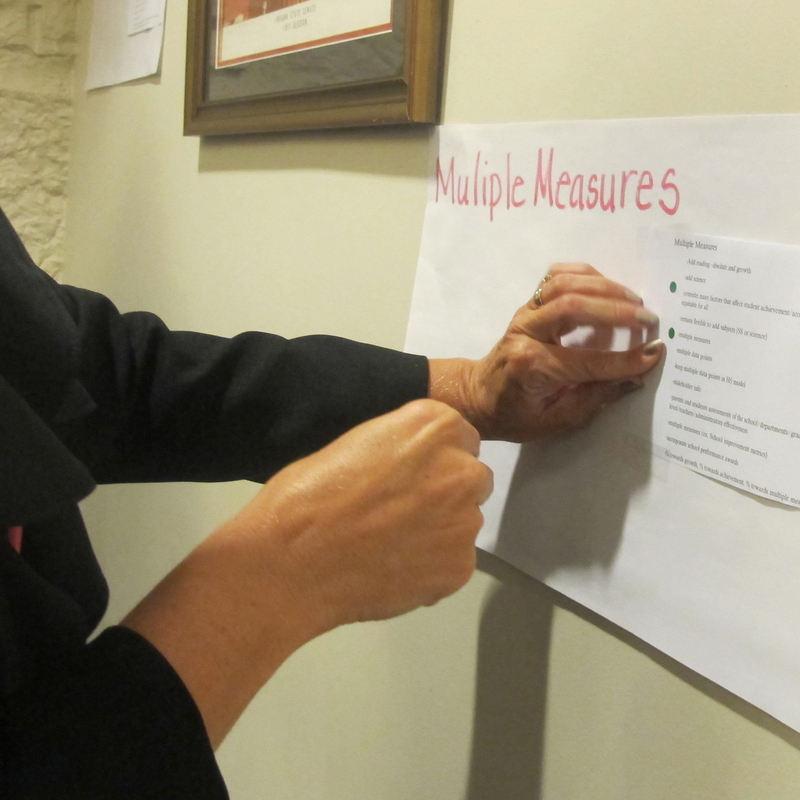 The proposed system includes more data points — that is, tests in grades 1-11. Right now, students in first and second grade don’t take state tests. But as state superintendent Glenda Ritz points out, they do take classroom assessments. 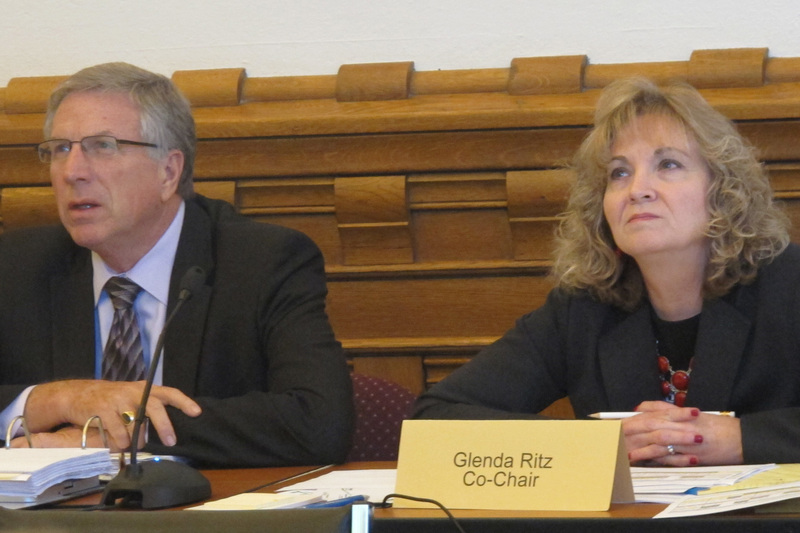 “We’re talking about an assessment piece to hopefully reduce all the assessments that are happening at the local level to inform instruction,” says Ritz. Other recommendations include dividing students’ test scores into six to eight tiered performance groups. That’s a change from the current system where students’ scale scores can fall in three categories — do not pass, pass and pass plus. In the new system, student “growth” would be measured by how many levels they increased or decreased in a year. At each of the lowest performance categories, the goal would be to move students up at least one band every year, even if they fall short of proficiency. That’s led to long discussions among the 17 panel members about how to handle students who arrive at school two or three grade levels behind their peers. The goal was to design a system that rewarded incremental gains without punishing high performing schools where a majority of students are already proficient. But as the panel discussed the new growth categories, Brownsburg Community Schools Superintendent Jim Snapp questioned whether the panel really met their charge. “We can’t even get a model that meets our first and simplest goal, which was to make this transparent and easy to understand,” says Snapp, adding that he thought the different passing levels would be difficult to explain to parents. But the proposal does do away with bonus points for high or low growth — points that made grades difficult to understand without context. Southwest Allen County Schools Superintendent Steve Yager, who co-chaired the panel with Ritz, says the result is a system that will better answer parents’ questions about local schools. “Did the parents get the bang for their buck from that classroom teacher, and the curriculum, and the instruction during that school year?” says Yager. The current 4-point scale becomes a 100-point scale. There will be different frameworks for grades 1-8, 9-11 and 12. Currently, there are two distinct models — one for elementary/middle schools and one for high schools. The model will look at both proficiency and growth. The ISTEP+ — or whatever assessment replaces it — will remain the primary indicator of school performance. Reading performance and growth will be indicators under the new model. At the high school level, PSAT participation will become an indicator of college- and career-readiness. The model will add high school growth to proficiency once data is available — again, this depends on what test replaces the ISTEP+ and End of Course Assessments. The state’s college- and career-ready goal will remain 25 percent of students, multiplied by 4 to get a score on the 100-point scale. Eventually, the goal would be to increase participation in college- and career-ready activities to 100 percent. Of course, none of the recommendations are final — the State Board still has the ultimate say in how to rewrite the state’s accountability model. They’ll consider the panel’s proposal at their Nov. 8 meeting and vote on A-F categories Nov. 13. The rule-making process could last as long as a year.